Waiting for mama to get ready. Miss Queen of the Road. Count my toes (she is a poly), we did 10 hours today. 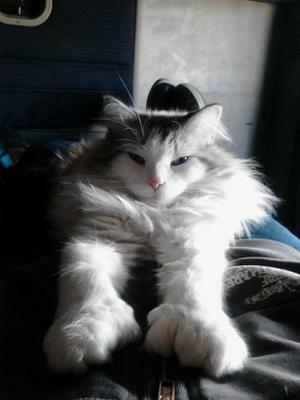 I have been told that my cat "Crystal" is a domestic long hair and I was told by others that she is a Norwegian Forest. Either way, I love her the same. Just need to know so I know of possible health issues. Crystal is a wonderful cat. She is very smart and learns quickly by watching what us humans are doing. We had adopted her in Jan 2011 and she has brought so much joy to our lives. 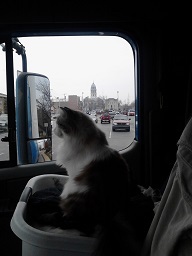 I am an over the road truck driver and would bring Crystal on the road with me. She loved it and I loved having her with me all the time. She would sit in the passenger seat and watch out the window, sit on the dash and navigate or nap a nap on my lap. Thank you for letting us share our story. AND SHE DONT WANNA GO THERE!!!!!!! 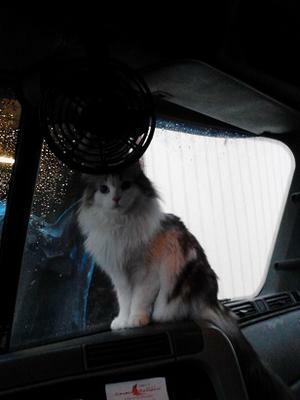 im not that lucky as you to have a truck car friendly cat.